Making long-grain inlay material for the top is straightforward – the same process I used before. However, there’s inlay across the end of the table and that grain runs the other direction. If use the long-grain inlay material it’d be laid into dadoes cross-grain to the table top and that could lead to some major cracks across 3.5 feet. So, I want to make up some short-grain inlay material. I start by chopping a single 6″ cherry board into pieces that I’ll glue together end-to-end to make a 4 foot wide “board”. Below you can see the cherry pieces lined up in order. They are touching where I’ll glue them up (long-grain to long-grain). 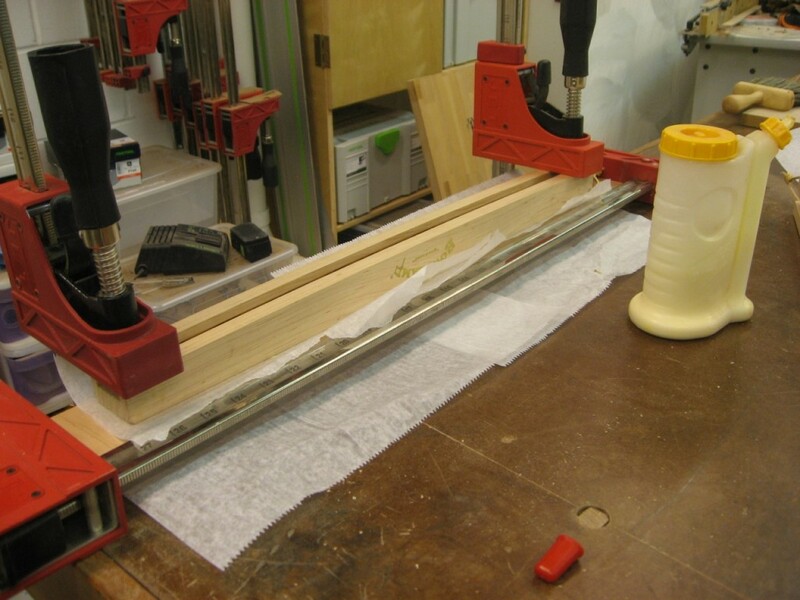 The pieces are glued and clamped together with a single parallel clamp across those 8 joints. Since they are small pieces, I also clamped them flat to my assembly table with a bow clamp! Perfect use for this clamp accessory. Wax paper makes for easy cleanup. 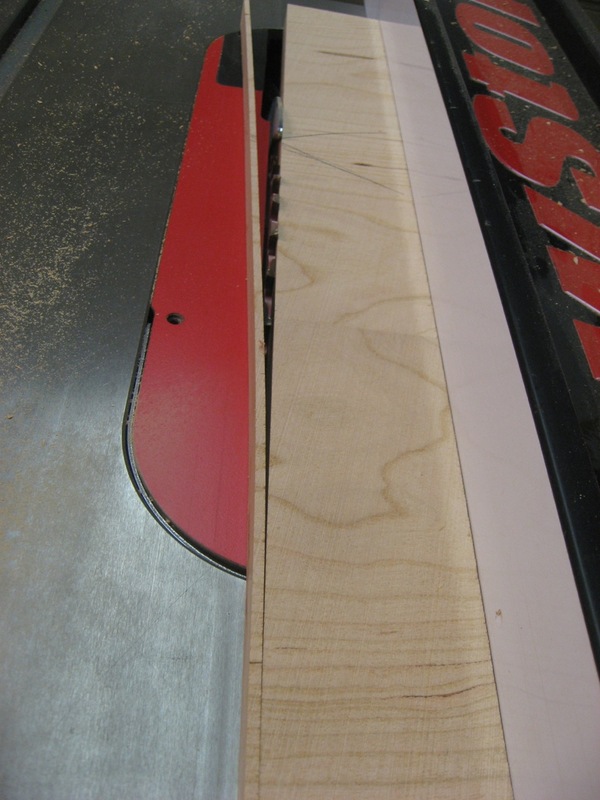 Once dry, I cut off slightly oversized strips from this very wide cherry “board”. 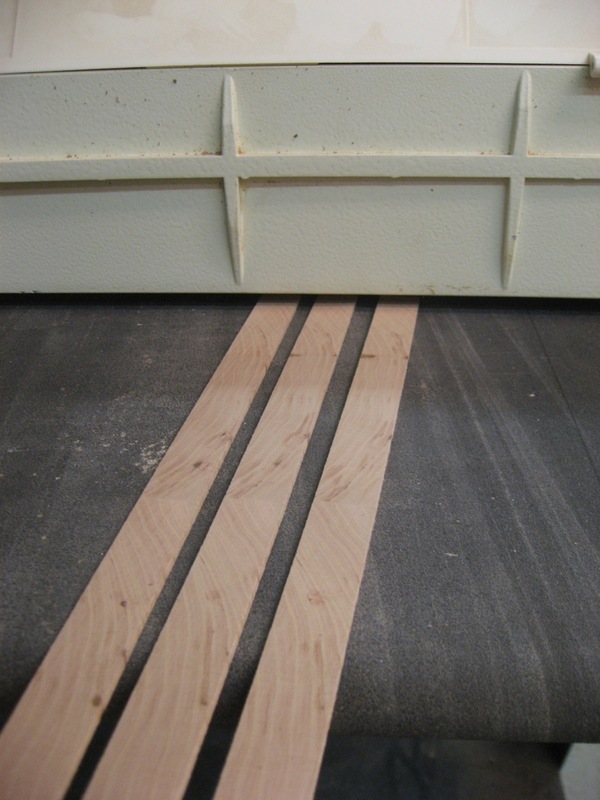 Cutting off strips of inlay from my wide cherry "board"
The strips are dialed into thickness with the drum sander. The end-grain here (thickness) are the sides of the inlay; the part you see in the end are the 3/32″ edges on the left or right. Yes, these are fairly fragile pieces since it’s short-grain. But honestly it’s not nearly as bad as I thought it might be. The strips hold together fine with careful handling (not even that careful!) 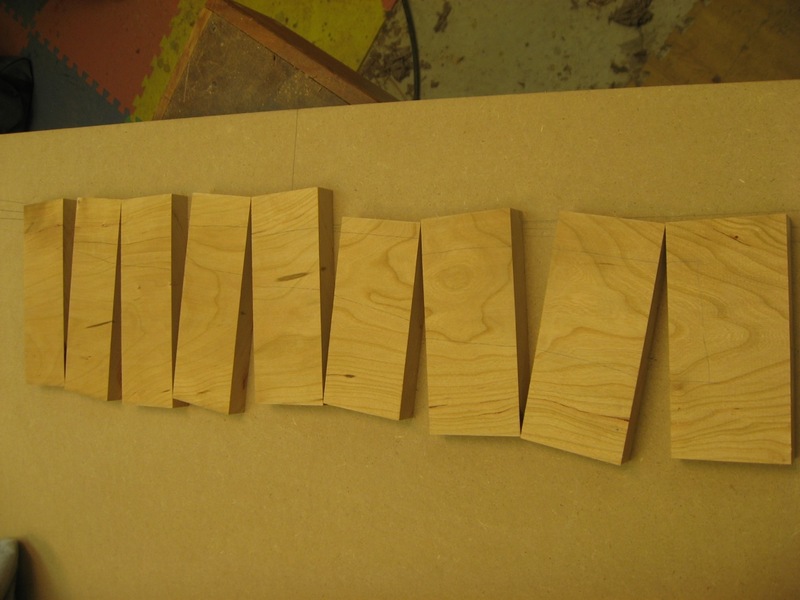 – and even when I cut off a single piece for inlay (about 1/8″ x 1/8″ x 3′) – they hold together as long as it’s supported. Cool. New Wood News Column: Tips from Sticks-In-The-Mud Woodshop Morton’s Shop: Dining Room Table Complete – Final Pictures!